Are you thinking of taking on a new pet? Come and see us first! We offer a free pre-purchase advice clinic, with a nurse, to help you make the right choice of pet and then prepare for their arrival. Bring your new companion in for a free health check as soon as possible so we can identify any early problems and advise on diet, disease and parasite control, training and socialisation, Identichip, neutering and insurance. Once your new pet has settled in, vaccinations should be given to puppies from 8 weeks and kittens and rabbits from 9 weeks. Free puppy parties are fun and educational for puppy and owner, and are run regularly for puppies who have had their first vaccinations. 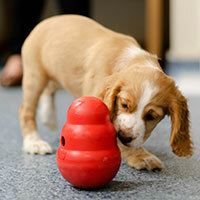 During adolescence we will monitor your pet’s growth and development and help with any problems that arise. Cats should be neutered from 4 months, and rabbits at 5 – 6 months of age. Young dogs can be seen at 6 months old for a free health check when we check on their weight and development and give advice on whether and when to neuter them. An adult worm control programme will also be discussed. We recommend annual health checks for a clinical examination, weight check and health review. We advocate vaccination tailored to risk and lifestyle, and have therefore chosen a vaccine that only requires a full booster every 3 years, with part vaccination at each interim annual check-up. Obesity and dental problems are known to cause many diseases. 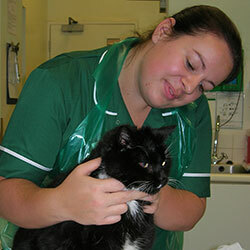 We can refer your pet to our free nurse clinics for practical advice and support. Modern veterinary care and diets have resulted in longer and happier lives for our older pets. Regular health checks will detect early signs of ageing. Many conditions can be helped by special diets and supplements. Safe, long-term treatment options are available for arthritis, senility, incontinence, heart problems, diabetes, kidney and liver dysfunction, among others. Patients requiring continuous medication e.g. arthritis, diabetes, will have a health check every 3 months, with discounts on their drugs. 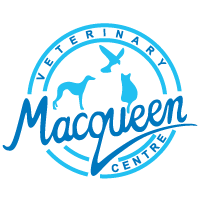 Throughout your pet’s life we will discuss all available options with you, so that we can choose their most appropriate form of care.